Here is a riverside view of the Jaymar mill operation in the 1940s. Does anyone know how many times the Jaymar mill burned. I can remember two times. Does anyone know how they received their logs? Flume? Log raft? Truck? "In 1887, after living in Portland, he came back to Hood River for good. The Natural Ice Co. of Portland sent him up here to cut ice, which was once 14 inches thick near the Jaymar mill area. 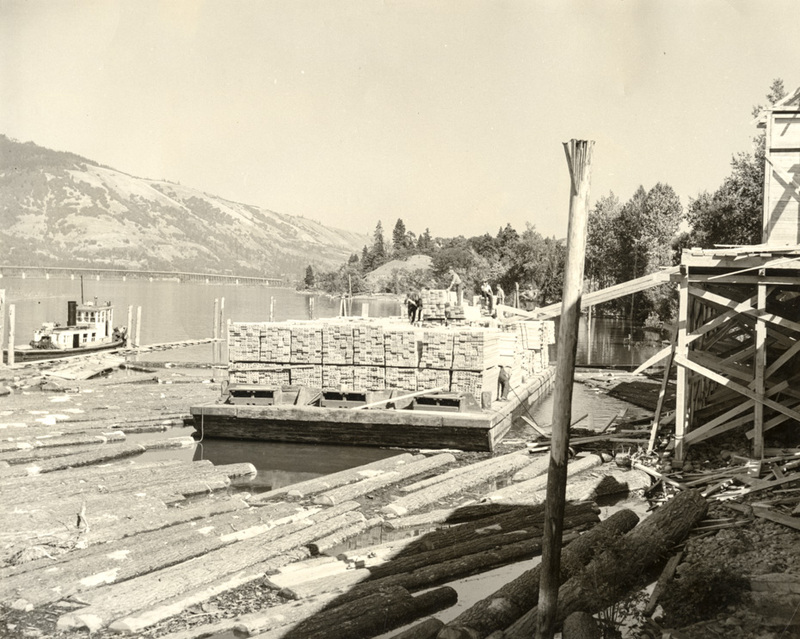 As many as 5,000 tons of ice a year were shipped out of Hood River in these pre-refrigeration days." An article in the July 31, 1954 Eugene Register Guard says the mill is the third largest in the HR Valley. It normally employs 35 to 40 workers and was established shortly before WWII. Due to prices of lumber and labor costs the mill has announced that it is going out of business and will dismantle. It looks like that hill in the back ground is the hill that is now fully contained within the Hook. Looks like the mill would be inside the hook also if it were still around. That land - at least part of it - is the frizzby park directly across and north of the skate park? Yes, that's the same hill that is within the hook. You can still see some pilings left from this operation between the opening of the Hook and Well's Island. The mill property included land on the other side of the railroad tracks which is now the skatepark and the undeveloped parcel which is used for Frisbee golf. Jaymar left a big pile of sawdust burning in a gully south of the mill.